A little over a month ago, I had a speaking engagement at a conference. I was also meeting a number of my coaching clients for the first time. In the lead up to the conference, I was determined to have nice long strong nails for the weekend. To achieve this, I had a routine of using strengthening oil on my cuticles and coating them with Sally Hansen’s “Hard as Nails” Strengthening Polish twice a week. (If you have not used the Hard as Nails polish, try it, it is great for growing long healthy nails.) By the time of the conference, my nails were GREAT!! Nice and long and strong. After the conference, I was even busier than usual, and self care was the thing I neglected. I felt I just did not have time for me amongst everything else that was going on. 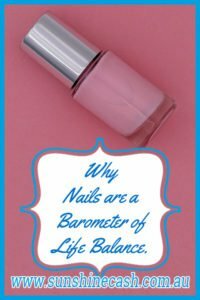 Exercise, quiet mediation time, and – yes- my nail routine, went out the door. My plan for this week ( and subsequent weeks) is to take back some me time and rebalance my life. I know that this will mean i have to delegate some tasks, and outsource others for a short while, but it is necessary. Do you make YOU a priority in your week? Let me know in the comments.